It was time to look down under the huge beech trees in the acre garden to see if there was any sign of the first wild flowers of the spring appearing. I was heading for the solitary elder tree that is around four metres high and every time I see this elder it make me smile. The reason is that it was not until we had been this house for about ten years that I realised that the elder was there at all. 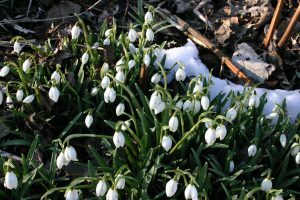 Even then I would not have seen it if I had not been looking for the first spring flowers, a colony of snowdrops. So twenty years ago I had stood over the snowdrops and for some unknown reason I wondered what the shrub was growing over them I thought it was an elder but as it was the end of January there were no leaves, not even buds, and so was not until later in the year that I realised it was an elder and the only one in the garden. Elder is a small deciduous tree and native to the UK and it is thought that the name elder is from the Anglo-saxon “aeld”, meaning fire, because its hollow stems were used as a bellows to blow air into the centre of a fire. It often grows near rabbit warrens or badger setts, where the animals distribute the seed via their droppings. Badgers love to use the grey brown, corky furrowed bark to sharpen their claws although there has never been any sign of this on “our” elder although there is a badger sett not far away. Elderberries are eaten by a wide variety of birds from blackbirds to robins and mammals from wood mice to pine martens. We also use it for a variety of purposes such as elderflower wine and elder syrup from the berries. It has been widely used in myths and folklore. It was supposed to protect against witches and could ward off evil influences so they were widely planted next to houses and cottages. It was traditionally the tree on which Judas hanged himself or the tree of the cross of Calvary, being supposed to be twisted and stunted ever since. However, my original thought of visiting the elder today was to see if the colony of snowdrops growing under the tree were flowering, a sure sign of spring and one of the first. How pleasing to see that not only were the leaves of around forty plants well up but about half of them, if not more, were also in flower. For some reason their vivid white petals looked so important and significant against the otherwise drab looking trees and shrubs from beech to ash and sycamore to rowan. It is one of the earliest of spring flowers and even when there is snow on the ground the leaves will push through if it is not too deep. No wonder then that one of the local names for the snowdrop is “snow piercer”. How the flowers manages this is because of a small leaflet like sheath that covers the top of the flowering stems so that they can force their way through the snow. My favourite local place to see snowdrops is on the roadside verges on the Black Isle between Udale Bay and the Newhall Point just round the corner. There you can find large numbers of snowdrops but also large numbers of butterbur and they are very impressive so why not go along this weekend and see for yourself –you will not be disappointed. This entry was posted on Thursday, February 16th, 2017 at 6:59 pm and is filed under Wildlife in the North .